To really live: Everyday do something that scares you . . . so I am told. Afraid of heights? Me, too. Friends with whom I regularly backpack in Hoosier National Forest dared each other this past weekend to try holler hopping. 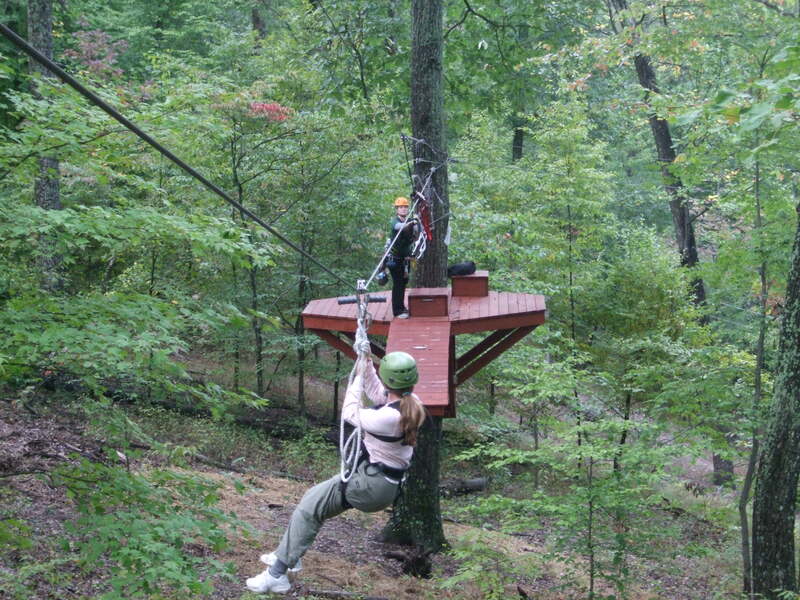 In the rolling hills and fall colors south of Bloomington, Indiana, we found Explore Brown County zip lines. The tour operation is hidden back in the deep woods several miles from the highway. My first impression was that we’d stumbled into a survivalist’s compound. Scenes from Deliverance ran through my mind. The rocky driveway brought us past several wooden cabins, fencing, camouflage netting, and two WWII troop trucks. The place was deserted. Soon, bright young folks who run the tours showed up. The trained guides fitted everyone with a helmet, harness, and tethers featuring parachute-quality straps and carabiners––about fifteen pounds of equipment. 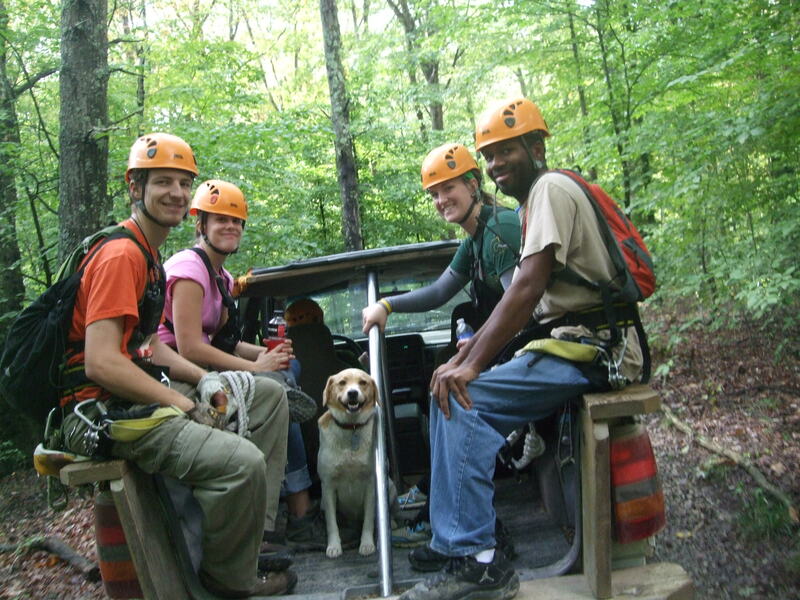 They explained the safety procedures and demonstrated how to sit back in the harness to enjoy the scenery while zipping across the deep hollers and ravines from tree to tree. Six guides loaded our group into a trailer behind a pick up truck and hauled us into the woods past an 800-acre paintball combat zone. Abandoned buses, sheds, cars, and playground equipment were scattered in the forest as hideouts from which paintball enthusiasts ambush their opponents. We managed to get through without being splattered with blue and yellow. The truck dropped us off on a ridge top where we split into smaller groups of two and threes. 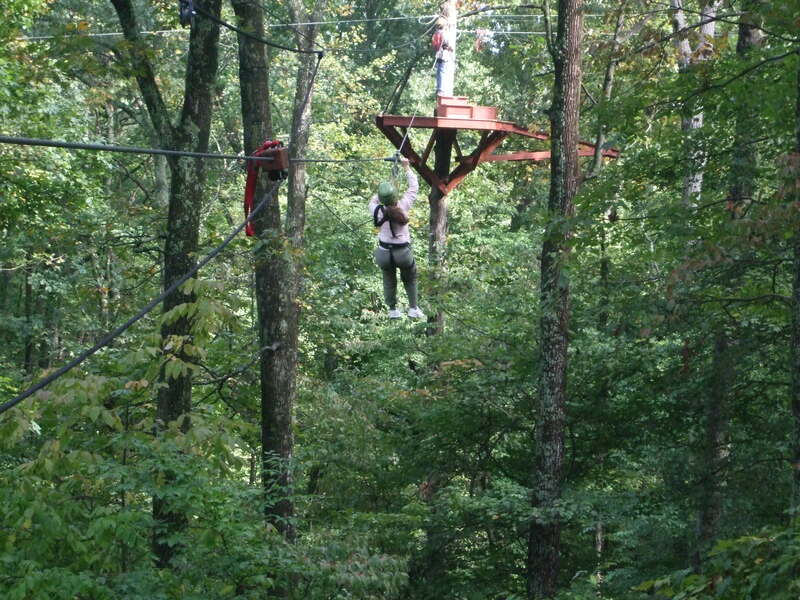 We walked to the first of five ziplines which began with seven steps up to a platform built into a tree. No problem. Krista, our guide who would “catch” us at the other end, zipped across the fifty-yard cable with ease. Duran, the “sender”, clipped my “zipper” to the steel cable in two places and unclipped me from the tree. “Jeanne is ready to zip!” he said into the radio. “Zip on!” yelled Krista. Heck, if she could zip, so could I! I sat back and let gravity take me out over the ravine. The zipper whirred over the cable, and I flew over the ravine. Momentum twisted me around backwards. I flailed with my legs and reached for the handles, but couldn’t remember how to straighten myself out. Before I could worry, my zipper hit the wooden block brake, and Krista caught my tether. Krista clipped my carabiners to the tree and prepared to catch my friends. The tree swayed as the weight of the next zipper bowed the cable. Duran had assured us that the trees sway like skyscrapers . . . no danger. Even so, I gripped the steel cable. Someone asked Duran if people ever peed in their pants while zipping. “Yes, before they even start.” It’s all in the attitude, I guess. One can talk themselves into fear . . . or out of fear. I did okay and even looked down from the platform fifty feet in the air. Each successive tree platform was in a taller tree on a steeper ridge. The five ziplines got progressively longer and faster. On the third line (400 yards) I managed to snap a few pictures while spinning around and going backwards. The last and longest zip of 450 yards was a tandem racing line. Krista rode across with one leg casually crossed over the other. I gave that a try and relaxed to enjoy the scenery. I zipped right past Duran and nearly kicked him in the nose. He missed my tether. On the swing back, he caught my feet and dragged me in. The tour ended too quickly. I wanted more! What an exhilarating feeling––like flying! I’m glad I stepped outside my comfort zone and faced my fear of heights. Try it, you’ll like it! Looks like you have a great time. I would love to do some of those things. Caleb, Your website looks awesome. I’ll have to “zip” through Tennessee someday. It sounds like you were referred to one operation and found the other. That’s OK. There are two great operations in Brown County Indiana that, between the two of them, seem to cover the entire spectrum. The actual “Holler Hoppin’ Zip Line Tour” is located down the road from Explore Brown County Zip Line Tour at the Rawhide Ranch in Brown County. 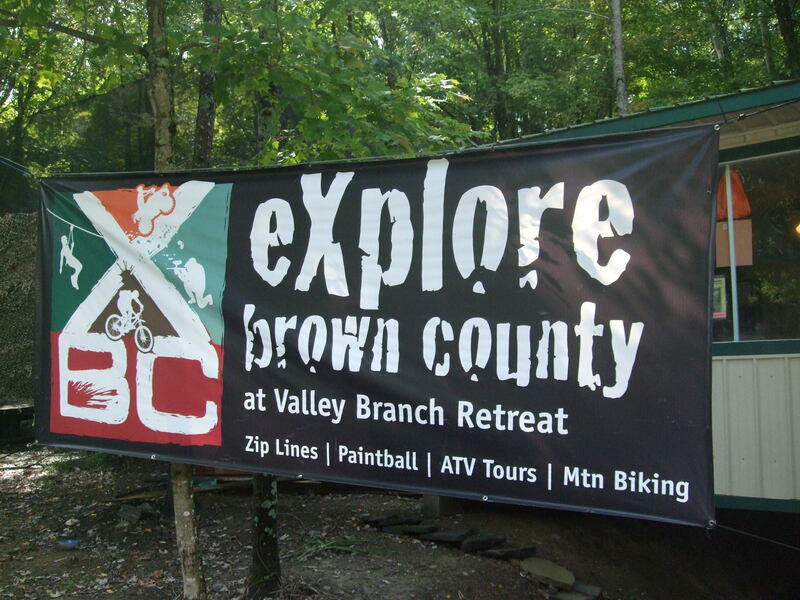 Explore Brown County likes to be known as the longest, highest and fastest zip line tour in Indiana and so far, they certainly are. 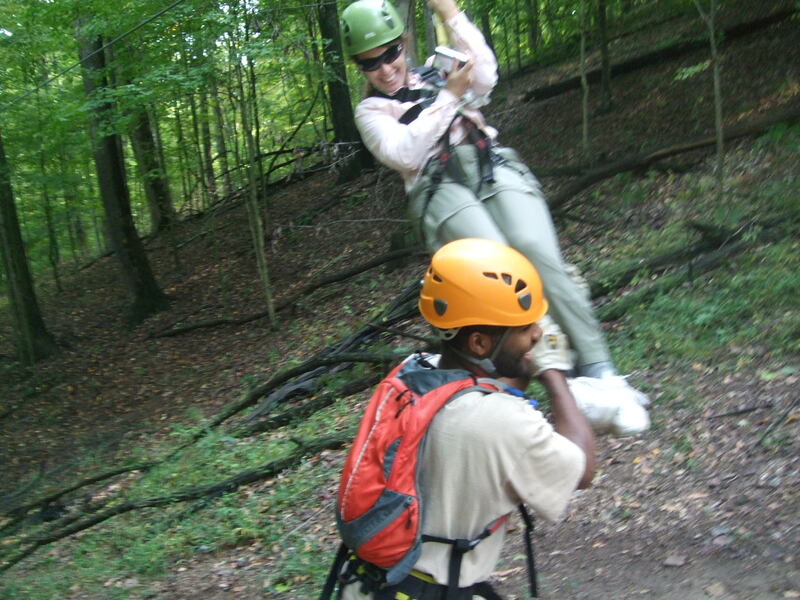 There are lots of styles and varieties of zip line operations. With the new interest and enthusiasm for zip lining, we will see them pop up all over – either trying to outdo each other or looking to find their own unique niche. In contrast, Holler Hoppin’ Zip Lines is a family oriented zip line tour on the grounds of the popular Rawhide Ranch Guest Ranch in Nashville. The approximate 1.5 hour tour has six zips at the family accessible rate of just $30/person (compare to others at around $65/person). Holler Hoppin’ is a start on your feet-land on your feet tour – great for first timers. It has a different style and focus. There is not as much effort spent trying to be the biggest, scariest, adrenaline rush but rather works to be the best family interactive experience in Nashville IN. Lots of silly fun and an ever changing format. Thanks Fritz for the added information. I like the name “Holler Hopping”. Next time I’m in Brown County with younger family members, we’ll give the ranch a try. They’ll love it! It sounds like you sure do lead an exciting life! Hi Cathy, Life IS exciting. I’m enjoying retirement.